Digital content is the driving force of content delivery in business and even consumer applications and is growing by leaps and bounds. One of the fastest growing methods for distributing content is through flash memory which is most commonly recognized as USB pen drives or SD/Compact Flash cards. Flash memory devices are used in a multitude of components including computers, smart phones, portable gaming devices, and other useful hardware applications. With so many devices able to use and specifically geared toward this form of digital media, content providers large and small will need a way to make quick reliable copies. This is why Vinpower Digital has developed a line of flash copiers like the USB Shark duplicator. Asynchronous Duplication: Able to copy any size master data onto multiple sources asynchronously (independently) without sacrificing duplication speed or quality for faster and more reliable duplication. Smart copy feature: This feature is used to quickly copy all accessible content contained on the USB device. Future functions upgradeable through firmware: Duplicator is able to be upgraded by future firmware updates. Secure Erase: Fully erase the USB device without the data being recovered. Multi-Language capability: The text on the LCD screen can be displayed in English, Spanish, French, Japanese & more. Chinese can be added upon request. 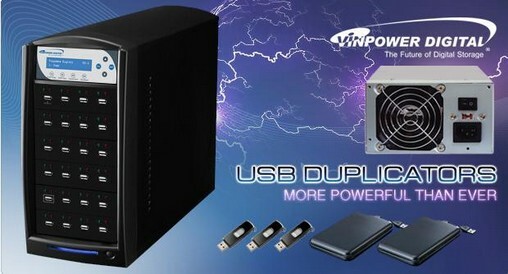 Vinpower's USB duplicators can come with optional upgraded power supplies to better accommodate the large capacity external HDD's with USB connections. With an almost exponential increase in the amount of required storage, many people of turning to external hard drives (HDD’s) for additional capacity or so that they can more easily share content across multiple computers. However, these external HDD’s also require more power than a single socket in a USB duplicator is designed to provide. Vinpower recognized this issue and instead of forcing users to minimize the number of external USB HDD’s they can connect to a single USB duplicator, we decided to work to boost the power flowing through each socket to accommodate the greatest number of external HDD’s at one time. So if you require a USB duplicator that can perform a series of external HDD duplications at one time, contact a Vinpower representative and ask about securing a Vinpower USB duplicator with the added upgraded power supply to significantly boost your throughput!